They are NEVER in the wrong or the villain. Manipulators will never ever admit their faults. When they tell you stories about interactions with other people, they will ALWAYS make themselves the victim or hero, never the villain. Many times in my relationship with my narcissist, he used my caring personality to his advantage. He would ALWAYS tell me about how people treated him poorly or how the world seemed to be against him because nothing ever went right for him even when he was apparently doing everything right. The way he was able to portray pure sadness and the persona that he truly felt as if he never deserved to be treated the way he was being treated seemed SO real. I fell for it every time and defended him to everyone who doubted. 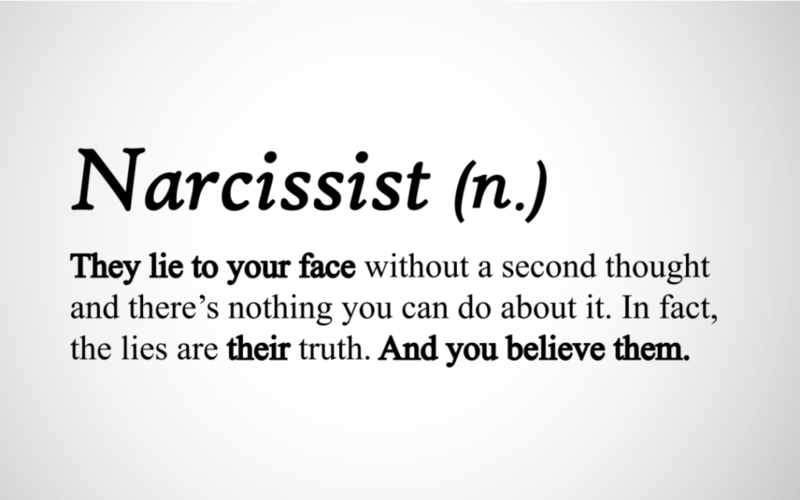 Narcissists may also be pathological liars who completely believe their own lies no matter how wrong they will be. They use this to turn themselves into always being the victim. As soon as my narcissist was able to get me to believe his stories, he used me as a puppet to try and manipulate others in his life that wouldn’t be so compliant with his controlling tactics. Sometimes we would also be at the store or somewhere else in public, and he would occasionally kiss me randomly while we were shopping. After a few kisses, he would become serious with me and tell me, “We can’t be kissing so much in public. You need to stop doing that. I thought we talked about this.” I absolutely knew in my mind that I never initiated any kissing, it was always him, but because he was so convincing and controlled my mind, it made me second guess myself and think that I truly was the one initiating everything. He also did this with the assaults. After every encounter, he messed with my head to convince me that it was either MY fault or BOTH of us that were “letting” or “making” it happen. This is the exact reason why it took me a month and a half after the break up to realize how badly I had been controlled and sexually assaulted. They tell you that they “love” you. I love the things you do for me. I love the power you give to me to take advantage of your kindness by exploiting your good intentions. To make you feel worse makes me feel better. I love making you feel small and insignificant. I love the fact that your life is all about me. You fix my problems, solve my issues, relieve my pain. I love how you take all your time for me, not yourself. How you give your full attention to me. I love how my expectations of you are constantly rising, while the ones you have for me gradually decline. I love the look of failure and disappointment on your face. It is scary how accurate that pretend letter is when it describes narcissists. When my narcissist noticed that I was pulling away a little bit when my family began to be more vocal about how they felt about our relationship, he convinced me to create a list in my phone of “reasons why I love you” so that I could “always remind myself why I loved him and why we should get married” regardless of what my family’s opinion of him was. I, of course, thought that he wanted and needed that list to remind HIM and to keep him with me, especially because at the time I couldn’t even bear the thought of breaking up, but then was mistaken when he refused to read the list and insisted that I keep it for my own reminder. Narcissists never love you. They may use their lies and deception to convince you otherwise, but deep down, they are incapable of love. All they care about is having control over you. They don’t want you to go to anyone else for help or guidance. Throughout my relationship, my manipulator slowly pulled me away from the people I loved one-by-one. It started with convincing me to ditch my friends to spend more time with him because “he needed me”, and then eventually moved down to attempting to sever my strong relationships with my family. He was always whispering in my ear all of the bad things that I should be noticing about my family and tried to convince me that he was the only person that was truly wanting the best for me and wanted me to be happy. When I wanted to go see a therapist for the first time, I thought that since he was seeing a therapist himself that he would be happy for me and support that decision, but instead he did not like that idea and even tried to discredit my therapist without even knowing her. He told me that if I felt that I needed a therapist, he would rather me talk to him, his approved family members, or his own therapist. He couldn’t stand the thought of not having that kind of control over me. Luckily, I went to my therapist anyway and ended up changing my life for the better from there. Narcissists/Manipulators are VERY good at what they do. They slowly take over your life and condition you to become their puppet. The most important thing for you to do to avoid letting this happen is to not let your mind second guess itself. If you don’t have a good feeling or force yourself to suppress the red flags or concerns that may pop up while you are with them, GET OUT! I can guarantee that it will be painful and extremely difficult to separate from them because of the attachment they created in you, but you just have to do it. Block their number, delete them off of social media, whatever you have to do to not let yourself talk to them again. Listen to your friends and family. If any of your friends or family don’t have a good feeling about the relationship, maybe there’s something you’re missing. Take a step back from the relationship and check to see if they check any of the boxes that describe a narcissist. You are strong, smart, and deserve SO much better. Do not let the manipulators take over your mind. Get out while you can! 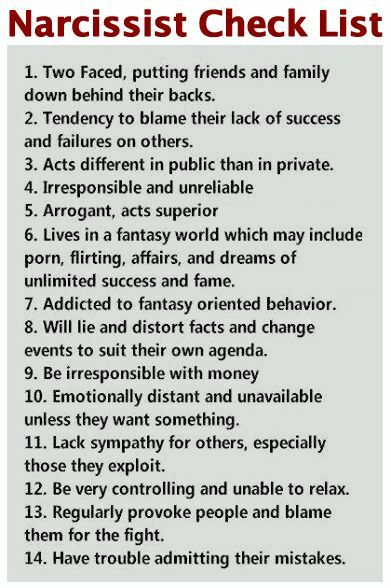 Here’s a summarized checklist that describes a Narcissist. Follow me on Instagram @youstillhaveworth, friend me on Facebook, or shoot me an email if any of you would like to share your story or just need another survivor to talk to.